The calvados that I have tastes fairly similar to the apple brandy I used for this (actually perhaps a bit smoother than this one) so I think it should work nicely. From the PDT Cocktail Book - Applejack Rabbit. Apple brandy, lemon, orange and maple syrup. Yum! How funny, we had that one tonight as well. I used Laird's bonded applejack which I am not a big fan of and took me at least a year to track down. I much prefer a nice Calvados. Anyway, we really liked this cocktail. The maple seemed to round the rough edges the applejack, while not making itself noticed. A really good cocktail. The St Germain/gin/Campari/orange peel setup is nice. Kudos for the idea. The kudos have to go to Manifesto in Kansas City - their drink - my proportions though since the recipe doesn't seem to be published anywhere. Tonight - Widow's Kiss - apple brandy, yellow chartreuse, benedictine and angostura bitters. Boozy for sure - I added a little lemon to mine in the glass. Was happy with the addition. That one's been on my list for a while. It's waiting until I or someone I know is heading to the city so I can add Benedictine to my cabinet. Every time I intend to do that, I end up passing on it for something else I want more... but I'll grab it eventually. I have to confess amongst all this tasty craft cocktail discussion that what I'm looking forward to most right now is getting into tiki mode when the weather warms. Most of my purchasing lately has been geared in that direction. Eclipse Cocktail from the PDT book. Tequila, aperol, cherry heering and lemon. A bit smoky - I'd like the try the same combination with with another spirit and see the result. I wish you could see the pattern on these 'new' glasses - there are etched with a bamboo pattern - wait - I'll take a picture so you can see. They are a small glass - a little over 3 ounces to the rim. Picked up 3 of them for $4.99. Tonight - Amaretto Sour - Luxardo amaretto, lemon juice, simple, egg white and angostura bitters. Forgot the bitters, so added at the end to stir in. A huge hit! Sadly I am DD too often and only got the tiny one in the middle. So what do you think of the Luxardo compared to the Di Saronno? Haven't done a side by side to see yet. Perhaps tomorrow! I must say that I really like the etching on those glasses! A shame they aren't a bit larger but that size has its place as well. A lot of interesting drinks in the PDT cocktail book it would seem. I have it on order at Amazon but it has been on back order for awhile. I waited too long to make the decision to buy so I couldn't get it when I ordered a few other books there recently. I suppose I could cancel and order elsewhere but haven't gotten around to it yet. The Witchy Woman (plural Witchy Women?) - thanks Tri2cook. After I bought the Havana Club I went looking for ideas and found a recipe you had posted here in the Tiki thread. Sadly I had no long 'proper' straws - however bendy straws filled in. I liked that one. I can't remember where I found it but I remember the campari being the clincher for me wanting to try it. I've been trying to think of ways to incorporate some of my other favorite cocktail ingredients into tiki drinks... I'm sure I'll end up offending the tiki faithful at some point. For those curious on the source, Witchy Woman was created by Yao Lu formerly of Anvil Bar & Refuge in Houston, TX. 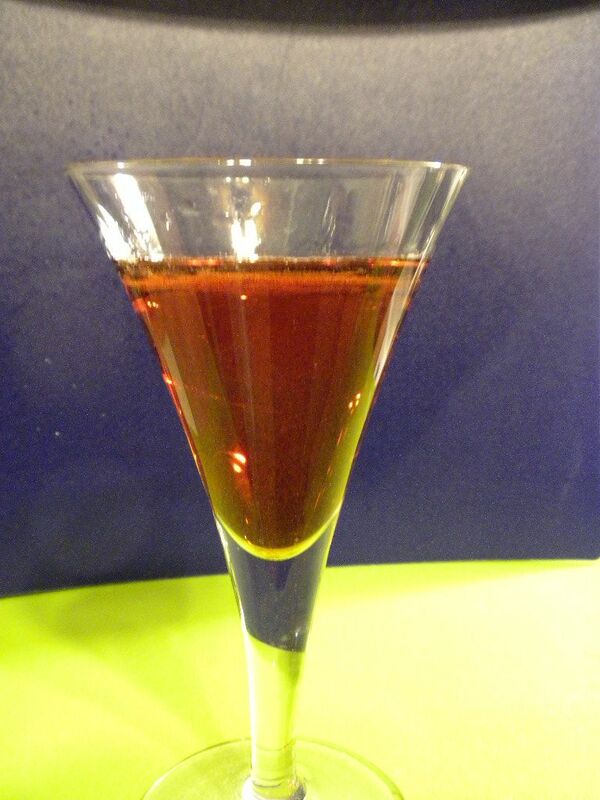 Did you sub Aperol for the Campari as the picture suggests? Not being as big a bitter fan that is something I might try in making this drink at some point. A little more orange but that is not a bad thing as far as I am concerned. Yup - Aperol was what the recipe suggested. Thank you sir. I did some digging through my bookmarks in my "tiki" folder and tracked down where I found the recipe. It was on the Imbibe website and does indeed include a credit to Yao Lu. Hmmm. The recipe I have calls for campari but I'd certainly be happy to try it with aperol. In fact, I think I will. Oops - brain fart - anyway try it with aperol! Me too - tonight from the PDT Cocktail book - the Edgewood. Gin, punt e mes, lillet blanc and grapefruit juice with a pinch of kosher salt. Not one of my favourites - not binnable but not great. Tonight I went with the Cat's Pajamas... gin - campari - green chartreuse - orange juice - maple syrup - shake, strain, flame orange peel. Tasty. Tried the Applejack Rabbit. A tad sweet, but overall an excellent drink! Looking for direction. I started with an Opal: three dashes of orange blossom water, 1 oz gin, .5 oz orange juice, .5 oz Cointreau, sugar (I've yet to arrive at a quantity, as the recipe I found measured sugar--a granular thing--in 'dashes', which was new to me. And it's okay, if you like the flavour of orange blossom water. It's sweet not so much in the sugary sense as in the floral sense. The orange blossom flavour is very strong and, I think, interesting. The logical next step was a version jacked with bitters--either Angostura or Campari (I don't have orange or, say, chocolate bitters, both of which could maybe be interesting, at my disposal). The Angostura version was okay but the Campari one--I added a fairly non-specifc amount, maybe a teaspoon (which is a lot, I guess, when we're talking about adding something as strongly-flavoured as Campari to something you don't want to taste like Campari)--was good. Not perfect but good. I can fine tune the amount of Campari I add. Maybe ditch the orange juice and use the juice of blood oranges. I'm keen for feedback. Have I made a god awful mistake, adding a strong bitter element (which, I think, as strong as it is, still lets the floral orange notes shine and maybe makes them more interesting)? Is Campari the right choice or should I maybe look at, say, an extra couple dashes of Angostura over what I added before? Is it worth grabbing some orange bitters? This is the first time I've deviated from a recipe and I'm still getting my head around what a cocktail is supposed to be, exactly, so I'm not quite sure what the process for fine tuning is--especially when I can count on an audience of myself and maybe one or two half-drunk friends. Well if it tastes good to you, then it's not wrong. Generally a recipe like that, with spirit, liqueur, and orange juice, would definitely benefit from a bitter or acidic component for most palates. Sounds like you did a fine job of tweaking the recipe with available ingredients but do note that Campari has a significant amount of sugar on its own and is not an orange bitter per se.